I don't know how many of you are familiar with the blog Letters of Note, but if you aren't already acquainted with it, here's a taste for you. Shaun Usher, the blog's editor, posts pieces of interesting correspondence that he either finds or is sent that he thinks other people would appreciate. It is ridiculously engrossing - stopping after just one letter is a virtual impossibility. A recent post focused on a letter sent in 1971 by Marguerite Hart, a children's librarian at the newly opened public library in Troy, Michigan. Hart sent the letter to a number of luminaries, asking them to reply with a congratulatory letter addressed to the children in Troy, explaining the benefits of a public library. Astonishingly, 97 people responded, and Letters of Note posted the letters from four of those respondents: Isaac Asimov, Hardie Gramatky, Theodore Geisel, and E.B. White. Shortly after the post went up, the Troy Public Library got in touch, and now all 97 letters are available in PDF format on the library's website. 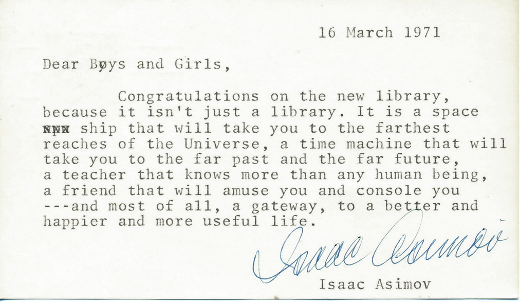 Below is Isaac Asimov's perfectly pitched letter; to read the other three featured, click here, or any of the 93 others, click here. Congratulations on the new library, because it isn't just a library. It is a space ship that will take you to the farthest reaches of the Universe, a time machine that will take you to the far past and the far future, a teacher that knows more than any human being, a friend that will amuse you and console you---and most of all, a gateway, to a better and happier and more useful life.